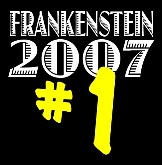 Frankensteinia: The Frankenstein Blog: #1 Story of 2007: THE LOST KARLOFF FRANKENSTEIN! #1 Story of 2007: THE LOST KARLOFF FRANKENSTEIN! This is a detective story, a puzzle, a case of film archeology. This is the story of how classic monster movie fans came together, solved a riddle, and wrote a new chapter in Frankenstein film history. In my book, there was no event more important this year than the discovery of a lost Boris Karloff Frankenstein performance! The credit for this extraordinary find belongs largely to film historian Scott McQueen, with contributions by Tom Weaver, Kerry Gammill, and the collective of horror and monster movie fans at The Classic Horror Film Board. The CHFB is a very knowledgeable community. Delving as they do into horror film history, passionate and generous in sharing their expertise, the members of the CHFB have made a number of fascinating discoveries. For instance, over the last year, tracking actors who have played the Frankenstein Monster, studying screen caps, deconstructing sometimes blurry images, CHFB members have identified at least 3 different stuntmen subbing for a frail Bela Lugosi in Frankenstein Meets The Wolfman (1942). The problem with this picture is that Karloff’s makeup does not correspond to any of his film appearances. It’s definitely not from the original 1931 film. Karloff here is much older. It is not from 1935’s Bride of Frankenstein, when The Monster wore burn scars, exposed skull clamps and singed hair. It’s not from 1939’s Son of Frankenstein either, when Karloff’s face was fuller, the makeup smoother, and The Monster was wrapped in a bulky sheepskin vest instead of his usual black coat. Karloff also wore the Frankenstein makeup briefly in a famous 1962 episode of TV’s Route 66. The makeup job on that one was quick and crude, not done by makeup wizard Pierce, and not at all like the one in the photo. So what are we looking at here? Evelyn Helmore, a long-time family friend, did not marry Karloff until 1946, well after he had abandoned the Frankenstein part. The only explanation for the picture, it seemed, was that Evie had visited Karloff in 1940, six years before they were wed, on the occasion of a unique, legendary non-film Frankenstein appearance. It was identified as such in Scott Allen Nollen's Boris Karloff: A Gentleman's Life, a biography written with the participation of Karloff's daughter, Sara Jane. Karloff stomped to the plate and grounded the ball. As The Three Stooges bumbled and butted heads, chasing the ball, The Monster clomped purposefully around the bases. The Stooges somehow got the ball, in extremis, to catcher Buster Keaton, who promptly keeled over in a pratfall faint when he saw The Monster bearing down on him. The result — one of The Monster’s most amazing superhuman feats — was an infield home run! Was the mystery picture from the baseball game? The members of the CHFB started asking pointed questions. For one thing, upon closer inspection, the makeup in the posed pictures doesn’t quite match the one in the baseball pics. The hair is different, nicely trimmed bangs on the Baseball Frankenstein, straggly hair in the posed pics. The forehead gash on the Baseball Frankenstein is sculpted differently than the one in the candid pictures, which cuts down through the brow. Most distinctly, Karloff in the posed pics looks definitely older, with prominent bags under the eyes. What gives? And, by the way, who IS that third man? 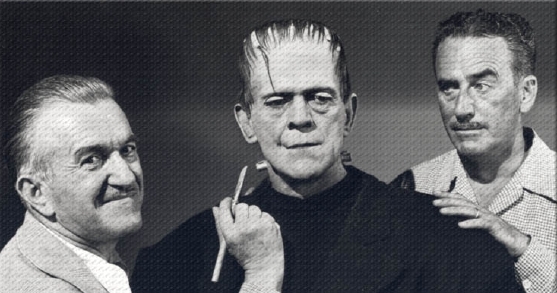 A first, tentative answer came from Scott McQueen who dug up an August 1946 memo from Universal Pictures authorizing the use of the Frankenstein Monster by Samuel Goldwyn Productions. Then, a CHFB forum participant, doctor kiss, identified the third man as film director Norman Z. McLeod, In 1946, McLeod directed Karloff as a villain to Danny Kaye’s daydreaming hero in MGM’s The Secret Life of Walter Mitty! All of a sudden, the puzzle pieces fell into place and we had an unexpected and exciting new discovery: In 1946, sometime over the April to August shooting schedule for Mitty, freelancing makeup man Jack Pierce came in and, with Universal’s legal blessing, transformed his friend Boris Karloff for a penultimate appearance as Frankenstein’s Monster! 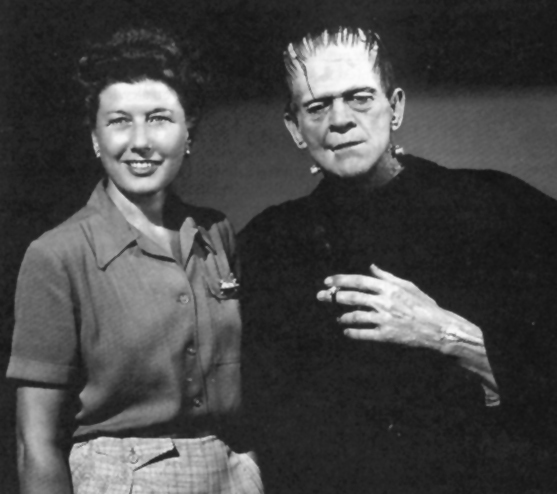 That day, Pierce and director McLeod, as well as wife Evie, posed with Karloff in Frankenstein getup. The question now, of course, is whether a scene was actually shot. Perhaps the makeup was done to see how it would photograph in color, but it is certainly likely, with the director present, that a scene, a short cameo, would be filmed. Why it was discarded is a mystery. Perhaps the gag didn’t work as intended. Or maybe it worked too well and “stopped the show”. The investigation continues. Perhaps a script can be found with the Frankenstein gag mentioned. Who knows, maybe actual footage of Karloff as Frankenstein’s Monster, in Technicolor, is slowly disintegrating in some forgotten film can, waiting to be saved. Whether anything is ever found remains to be seen, but still, an important discovery in Frankenstein history has been made. It’s amazing — and encouraging — that something like this can pop up after sixty long years. Congratulations, and thanks, to the people at The Classic Horror Film Board for bringing forth the #1 Most Important Frankenstein Event of 2007! If you enjoy classic horror, the Classic Horror Film Board forums will amaze you. You learn something there every day. If you ever decide to register (free) and participate in the discussions, you’ll find the CHFB crowd is enthusiastic and inclusive. They will welcome you with open arms. I hope you enjoyed my countdown of Frankenstein Events. Post a comment, let me know what you think! Awesome. Does the newsreel clip still exist of Frankenstein playing baseball with the 3 Stooges and Keaton? A great choice for #1. Your blog has given me a great deal of pleasure this year. Thank you for that. Clips do indeed exist from that newsreel. Congrats! This is indeed a wonderful place, with a steady hand at the tiller, as well as a great "crew." Clever history detective work one and all. This certainly deserves its place at #1. I enjoyed the whole list (though I have to wonder what flavor Pez comes out of the Monster shaped dispenser?). Frankenstein smoking a cigarette! I just realized you listed my blog on your Halloween countdown, thank you for that! Your blog is well done and I look forward to digging through some of the archives! Fascinating stuff. 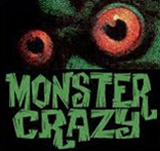 I'm particularly impressed with the Monster's mastery of small ball--kind of like the horror version of Ty Cobb. A new book,"Danny Kaye: King of Jesters" by David Koenig, describes the Frankenstein sequence in "The Secret Life of Walter Mitty." 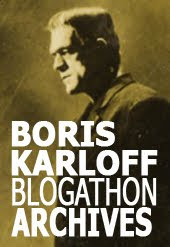 Koenig writes, "[Screenwriter Phil] Rapp suggested closing the picture"..."with a big gag, capitalizing on the casting of Boris Karloff as Dr. Hollingshead. At his new office, Walter would take Rosalind into the next room to show how the doctor's parole was working out--Karloff would be posing for the cover of Terror Stories, made up as the Frankenstein monster." The assumption is that the sequence was filmed, because when discussing the overlong running time of the picture, Koenig writes that "the Frankenstein gag at the end always seemed awkward, so it was an easy cut." Well... that explains neither point I raised above, the costume switch on Kaye-- an obvious continuity gaffe, indicating there was a chunk cut out of the movie-- and Kaye's over the top "scared" reaction to the real Karloff when he sees him. It's possible that this is the explanation, but it sounds more likely that there was a Frankenstein daydream sequence and a day's passage of time in the story. That would explain the costume gaffe as well as Kaye's reaction to the un-made-up Karloff the (presumed) next day. 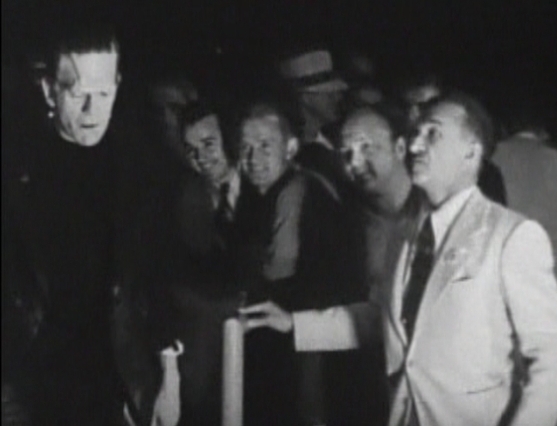 Plus, it would set up the kicker gag of Karloff posing as the Monster in the end.